For some reason, there’s a common misconception that budgeting and daily money management are only for people living paycheck-to-paycheck or young people just starting out. 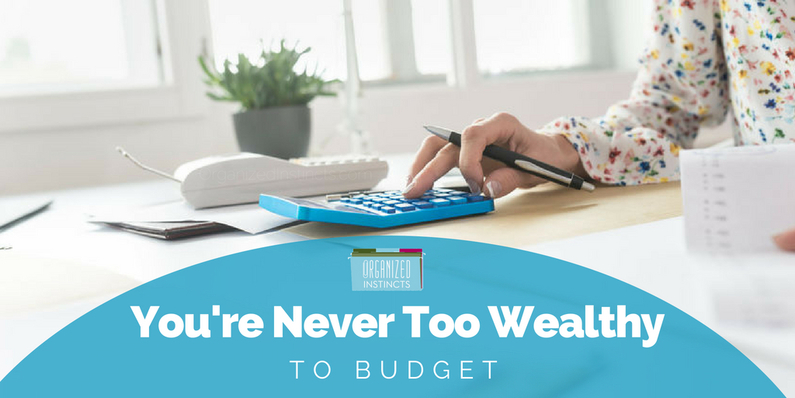 The truth is, you’re never too wealthy to budget. When we get comfortable and let daily money management fall lower and lower on our to-do list, we end up setting our money on autopilot. And that’s when unintentional spending happens. What you might think is only a few bucks here and there, really adds up. Phone plans – What’s your average monthly usage? (Open your statement or log into your online account to find out. Average usage over six months for a good data point.) Does that average drop you to a lower tier plan as opposed to your current plan and/or an unlimited plan? Credit Cards – You opened the account because of the reward benefits. But do those rewards (and their associated annual fees) really benefit you? For example, paying fees for a travel rewards card but you don’t travel. If you carry a balance on one of these rewards cards, the higher interest rate often makes it more expensive than the reward you are chasing. Club Dues – Swim club. Tennis club. Yacht club. You signed up the whole family and pay the yearly fee for a family. Yet only one or two family members go to the club regularly. This adds up to hundreds, if not thousands, every year. Subscriptions, memberships, etc. can really add up. Maybe you used to read Travel + Leisure or Architectural Digest every month. But it’s been ages since you sat down and read one of your (many) magazines cover-to-cover. Yet you just haven’t made the time to call or go online to submit a cancellation request. Digital entertainment services like Netflix, Hulu, and Amazon Video revolutionized how America watches TV. Yet you’re too busy to sit down and enjoy the service you pay for. You tell yourself, “Oh, it’s only $8, $10, $15 a month. Not a big deal.” There’re also homes with cable or satellite AND subscriptions to streaming services. They could save hundreds (!) a year by cancelling the extra services. Then there’s that app (or, more likely, multiple apps) you just had to have at that moment. You enjoyed them for a few months and now they lay dormant on your phone or tablet – taking up not only space on your phone but space in your bank account as well. Just because you delete the app does not mean the fees stop. Again, it’s about intentional spending versus money on autopilot. All these little charges add up to effects on your budget, financial goals, and overall financial health. No one we have met likes paying more, and regaining the satisfaction of paying only for what you use feels gratifying. Remember, you’re never too wealthy to budget. Do any of the above situations hit home? Then take back control of your money and spend because you want to, not because it’s set on autopay. We recommend you open your mail daily, pay your bills on time, and review transactions in your accounts regularly. Next time, we’ll delve deeper into the “I’m too wealthy to track my money” mindset.